This margarita is sure to turn heads. I was scanning the margarita list at El Bolero on Friday night in pursuit of something new, when two thirds of the way down the menu—outlined in a giant orange box as if to scream “Look! Look at me!”—I spotted The Oilman. “Please get it,” my healthy, wine-drinking friend pleaded. “I really wanna see it.” Truth is, I did too. 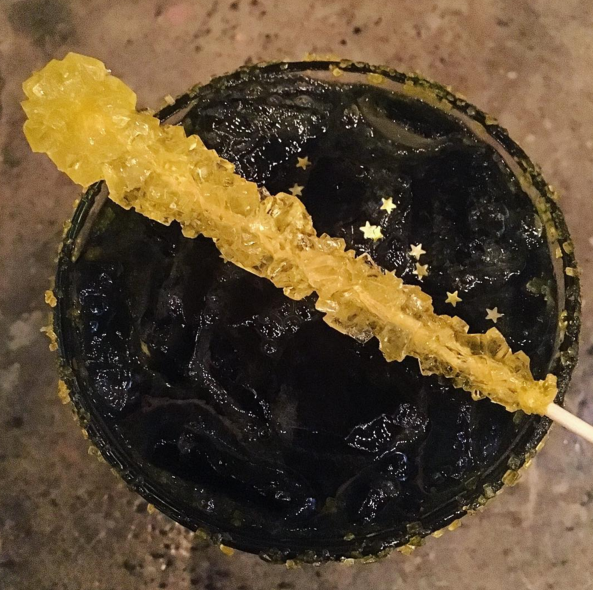 The drink is a mix of Código 1530 tequila, lime juice, agave, Cointreau Noir, gold flakes, gold kosher salt, and garnished with house-made rock candy. I envisioned the glitz of Dolly Parton embodied in a cocktail. Not sure why this was the first thing that came to mind. Probably has something to do with my recent revisit of Jolene. A glamorous, jet black margarita, flecked with iridescent stars and rimmed with gold sugar landed on the table as onlookers gawked. The drink gets its color from charred agave and a blue curacao and blackberry juice blend that’s added, and, despite its wild appearance, tastes like a balanced, well-crafted margarita. So, what inspired The Oilman? There’s no doubt that this cocktail is fun. The $18 margarita will turn heads while temporarily turning your tongue a playful charcoal-y hue. (That’s fun, right?). I’m pretty sure Dolly would approve.